Stop Stitching! What’s Your Time Worth? I don’t really want you to stop stitching! No, no! Never that! The title above is what I finally had to say to myself the other day. I knew I was wasting my time from the very start of the project. I knew it before I put design to fabric, fabric in hoop, thread in needle, or stitch on design. Now, don’t get me wrong. I don’t have some inflated value of what my own time is worth. How we value our time depends on so many different circumstances, and normally, we (or at least I) don’t consider the “value” of time when I’m getting a lot of pleasure from stitching, no matter what kind of stitching it is, how good it’s turning out, or what it’s intended for. But there comes a point! For me, it’s that point when I know the thing I’m working on is not going to turn out how I want it to; when I know that, no matter what I do to it, it won’t work! And once I know that, there’s no point in going forward. I was going to title today’s article Stitching on Crappy Linen. Friends, please understand me! I’m not that much of a fabric snob. Yes, I love good fabric. But yes, I gladly embrace and admit that some fabrics don’t have to be expensive to be good fabric, suitable for embroidery purposes. And yet. And yet…there are limits. The project that I envision here is a tote bag. It’s my dream tote bag. It’s just large enough to hold a few books, maybe some drawing pencils and a sketch book, maybe an embroidery project, maybe just some daily travel items. In my mind, my dream tote bag is made of heavyweight linen. It’s stiffish, crisp, sturdy, and lined on the inside with a pretty fabric. For this version, the outside would be a buttery-bright yellow and deep sort of French blue. It would have a pocket or two on the outside. And the pockets would be embroidered in a combination of blues, greens, reds, yellows, white – vibrant, kind of those Provençal Frenchy colors. I like those colors! And I like tote bags. So I did some research, scoured the online fabric shops that various folks have recommended to me, and finally ordered some “heavyweight” linen (they called it “canvas weight” on the website – alas, it is barely medium weight). You might remember my washing adventures with this linen a couple weeks ago? Yes, this is the same linen. After I washed it, the soft, fuzzy, limpid nature of the linen was my first clue that I really should not attempt this project with this linen. But still, I thought I should give it a chance. I figured that fusible interfacing might help when constructing the bag, to give it the body that the fabric absolutely lacks. I measured and cut a piece of fabric about 4-5″ larger on all sides than the pocket, selecting an area of the fabric that had the fewest flaws in it. The arrows in the photo above point to the fewest flaws. It took me a Whole Lotta Pickin’ to narrow down that area of fabric which seemed fewer-flawed than the rest of the fabric. Now, linen has slubs – even the best linen occasionally has a slub here and there. A slub is an area of fiber that’s a little thicker than the normal weight of the warp or weft thread, where some of the fiber has clumped up in the weave. And it’s quite ok for linen to have slubs. But unless you’re wanting really slubby linen for some particular effect, the fewer the slubs, the better the linen. Sometimes, you can safely remove the extra fiber from the slubby area, without damaging the woven thread. Sometimes, you can’t. When working with linen, you learn to like a slub here and there – it keeps things authentic – and you learn to live with the little darlings. These aren’t just slubs, though. These little lumpy bumps are more like bulbous hairy outcroppings that stick up from the fabric, that are part of the warp or weft thread, and that, if trimmed, it damages the integrity of the weave. Still, I can live with those bumps! I was willing to! I put the fabric in the hoop, as I am wont to do. There was no possible way to get this fabric drum-taut. It just would not stretch to drum-tautness in the hoop, no matter how I worked it. But I decided I could live with that. As I began stitching, the spongy feel of the fabric became a quick turn-off. But, I told myself, you can live with that. With every stitch, though, the fabric became looser and spongier in the hoop. Mind you, the hoop wasn’t loosening up – it was still tight and true. But the fabric, as I pulled each thread through ever-so-gently, became more and more stretched, more and more warped, until there was no point at all to using a hoop. You can see a side shot of the fabric in the photo above. Ripples. Waves. Mountainous crests and deep valleys. And fuzzy, bumpy fabric to boot. The final straw came after shooting a few photos and taking a close look at the stitching. Good fabric will always make moderately good stitching look amazing. Bad fabric will always make moderately good stitching look… just Bad. I am now seeking a different fabric solution altogether for my Dream Tote Bag. Something affordable. Sturdy. Natural fibers. Got any good suggestions for an affordable fabric suitable for hand embroidery, heavy enough for a sturdy tote, made of natural fibers, and available in a decent array of colors? I’m all ears! I have a couple test fabrics in mind, but I’m open to any and all suggestions! Feel free to join the conversation below! Tomorrow, I’ll announce the winner of Beginner’s Guide to Goldwork – if you haven’t joined in on the give-away, there’s still time! And I’ll have a few interesting tidbits for you, too, for your weekend entertainment. February 18, 2019 Embroidered Pocket on a Tote: Finished! while I don’t know if you would want to stitch on it, my favorite cloth totes are the ones from Land’s End. It is a heavy canvas that lasts forever, zips closed and comes in multiple sizes. It is a good, even weave canvas. Love Land’s End totes! They are quite nice, and that’s kind of the style I’m thinking of. Was wondering about canvas. I have not worked with it. Canvas would be stiff and sturdy. You could probably use a bottom weight twill or denim if you wanted something heavier and use a chenille needle with larger threads. Hi! Love your articles, always. I thought I could suggest something but I keep getting stumped on “natural fibers” and different colors. I do think that anything like a fine even weave would be good…may I suggest reaching out to the Nordic Needle and speaking with them about your needs…they carry many fabrics from several manufacturers and in larger cuts and yardages, and am sure they wouldn’t mind spending a few minutes speaking to you. Also, although probably doesn’t meet your “comes in many colors” criteria, I have found crisp linens (uneven weaves) at fabric stores, such as Joann’s and decorating stores. Denim might be good and not difficult to dye..if your into that! Good luck in your search. Try denim. It comes in lots of colours and is a nice twill. fabrics-store.com has wonderful linens in many weights. I should mention that I really wanted to love this linen, and while it’s suitable for other uses, it doesn’t work that great for hand embroidery. Plus, most of their colored linen comes pre-softened with a chemical fabric softener. The process really zaps the linen of any of its natural body. This makes it great for toweling and for apparel that has a more rustic hand, but isn’t so great for any kind of finishing where you’re hoping for the crisp, smooth body that’s characteristic of a good linen. Thank you for this timely blog. I have had a sampler on poor quality linen from a kit in my WIP stash for far too long. I will feel much better now about moving on to happier projects that feel beautiful as I stitch them. Asking yourself these questions usually gives you a clearer view of what you are trying to achieve, and a better understanding of materials. Hope you find a nice fabric because that tote bag sounds awesome! What about rug linen? I’m doing a hooked bag using wool strips but I would think that you could use a heavier thread. Also cotton mmk’s cloth? Previous post should say monk’s cloth. I like to use duck cloth for totes — it is cotton, washable, sturdy, inexpensive and comes in lots of colors. I have not tried to embroider on it though. At least it is worth consideration. I’m a quilter so I am very biased in favor of prewashing. With duck cloth, though, you must be careful about it getting creased in the dryer. It is best to pull it out while still a little damp and pressing it — the creases can be difficult to get out. For crispness, duck would be my choice too. But, it will be more of a strain to stitch. For stitching ease, the linen twill may be the best of both worlds, especially if you back it with fusible stabilizer. There is a nice thin fusible batting made especially for bags now. Connecting Threads is a good source. And no, I would not pre-wash duck. What a great blog posting! Actually they ALL are but this I have struggled with myself for several projects. I hate not finishing projects but when I do it’s usually because it is substandard by my standards. (Rest assured none of my projects come even close to yours – I could live with what you are rejecting!). Thanks for reminding all of us there are times when it’s necessary to just chalk up the project as learning and move on. I’ve had some great success with both inexpensive wool felt and basic muslins. I think you’re being a big harsh on yourself about how the stitching looks but then your stitching is so lovely and designs so pretty that you could literally make a silk purse out of a sow’s ear. Sow’s ear being that miserable linen you’re talking about. I am completely stumped as to what linen would be able to provide you with the lovely look of linen (versus evenweave) yet not stretch out in use. Have you asked some quilting buddies yet? I’ll ask around but linen is so famous for stretching and I’m sure the poorer ones are even worse. Surely there is a linen like in fine clothing manufacture that doesn’t have this aspect. As for the strength to be a tote, there’s all kinds of interfacing and again, a quilter who does things like make bags or other structural kind of items would be an awesome resource. Hope this helps. I just wish that I could curl up in a nice chair and stitch with you one day. I love how you write and stories in person must be wonderful. Take care and good luck and I agree that sometimes “one more stitch” just extends the problem. Oh, and my other axiom is “never start a new project at night.” So often I gleefully go to pick up the new piece (where I’ve changed colors) and think “where was your mind?? ?” Good luck and keep us posted! For a rustic tough cheap-ish tote bag fabric maybe try the heavy duty canvas tarps available at the big box stores? I have not sewn with it yet but it’s certainly lasted me a long time as a furniture/floor cover when I have to paint the walls! Oh how frustrating! You gave it a good try – nice to know that there are others who just decide “enough is enough” and put down a project. Good luck in your fabric hunt. I have never stitched a tote or bag before, but what you said about how a feeling of dissatisfaction with where a project is headed really hit home. For me, it’s like working with great quality vs. not. I’m happiest when the quality of what I work with suits best to the project…otherwise, I’m wasting my time. We all embroidery for the pleasure of it, probably even more than for the final outcome. I have used burlap for a large shoulder sling bag embroidered in wool with excellent results. It comes in different counts. I hear good things about jute,but haven’t tried it. Try the linens and twills from the home decor fabrics in stores or online. Many times home decor denims, linens and twills are better quality than quilt or garment fabrics these days. You don’t need to have the embroidery suffer. You can make a bag with somethingn as light as quilt weight cotton and have it be durable I have a bag that I have had for over 20 years that is my project bag made in that weight cotton. It is just getting raggedy. It is all in how the bag is constructed and the quality of the stabilizer you use to stiffen the bag. Pick the fabric that will work well for the embroidery and back it with pellon flex foam backing or car headliner. Pellon has several other fusible options in different weights and materials that will work well to stiffen the bag. Or if you want to be able to machine was, use a layer of quilt batting and fuse it with pellon fusible web. If you really want a canvas weight bag maybe use a canvas or heavy twill to make bag and make a window in the bag for the embroidery worked on fabric of choice. 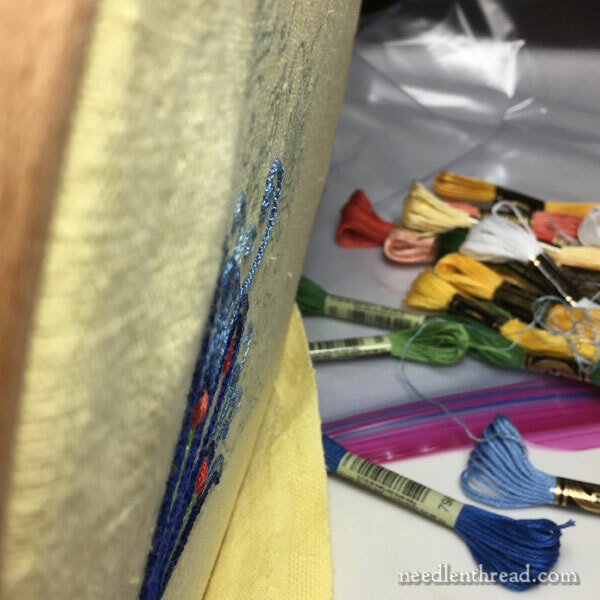 If embroidery is just going on the pockets, pockets do not and are often not made of the heavier tote material, again choose something that will work for the embroidery and stabilize/stiffen with a fusible interfacing/stabilizer afterward. I’ve been stitching a little fiber book on cotton duck cloth, and I have to say, it’s very easy to stitch. Seems like it would make a great tote. Try crewel linen twill from Threadneedle Street. I use it for crewel work projects. they have other fabrics too – including linen of various weights – I’ve bought some several times and it is always beautiful quality. Good luck…. I would use cotton broadcloth or trigger cloth. Cotton duck? Would the linen work better if you embroidered in wool instead of cotton? I really like the design- would you mind putting out here so we can use it? I love the design you have chosen for your tote bag. it’s a shame about the slubs and the spongy fabric after all the preparation you went through to start the project, very frustrating when this happens. I don’t have any suggestions for affordable fabric for a sturdy tote bag, I do hope you find the right fabric for your dream tote bag because I would love to see the bag with your embroidered design on it. Thanks for sharing your tote bag experience with us and for pointing out the slubs of some not so good linen. One of my favorite fabrics is a good quality wool flannel – such as Pendleton. Problem izs that I am still using what I bought many years ago. It is hard to find these days. I don’t usually wash it – just dry clean. But then, it doesn’t have to be cleaned often. Wool has body, drape-ability, beautiful texture. The colors have depth and sometimes a slight sheen. I have used it for stocking backing, purses and pillows. I have also embroidered on it with cotton threads and wool yarn. I have also used silk threads, but not for something that will receive much use. Well, I agree the fabric is not very nice, but I just love that pattern and the colors that you were stitching on that pocket! There are linens that are most suitable for garb for SCA re-enactors of lower classes. I think you purchased some of it. It makes lovely soft skirts and bodices and works quite well with a rustic embroidery, but is just not quite suitable for Great Works. Sometimes it’s just not worth it to persevere. I’m glad you realized this wasn’t one of those times, although I think the stitching looks lovely. That linen was never going to look crisp and clean no matter how wonderful the stitching, though. I love that design and the colors! I would construct the tote from quilting cotton (in colors to coordinate with the design), interfaced with a stiff fusible. 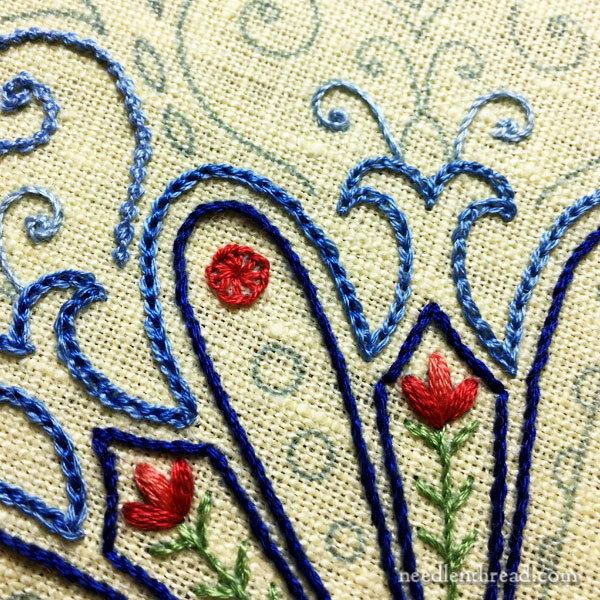 I’d use a good quality needlework linen for the pocket embroidery and line the pocket with interfaced cotton (I would not use a fusible interfacing on the linen and embroidery; the fusing process would flatten the embroidery too much). I’ve made quite a few handbags and totes…mostly cotton; a few handbags from some nice suit-weight linen lined with cotton. Perhaps you might let us know where you got that linen from so we can avoid the same experience? Hi, Sheila – this particular fabric came from fabrics-store.com, which has a huge array of linens that would be fine for some purposes, but I don’t particularly like it for stitching on. Well, I haven’t tried their non-softened. Most of their colors come as pre-softened linen. At one point, I’ll try the non-softened and see how it is. I bought a couple scraps of the non-softened, so we shall see! Could this be delightfully repurposed for something else? Like the two ‘dots’ on a yin/yang symbol, it stimulates my thinking about the joy of imperfection in everything… plus, the joy in Creativity and Repurposing, Conservation of natural resources and efforts. In Japanese tradition, a tea bowl will be mended with gold and honored, highlighting the imperfection, making it more valuable. Since the fabric sags in the hoop, maybe it doesn’t want to be constrained? Would it happily be worked in the lap without frame, carried anywhere? hmmmm… I might posit it as an Idea File. Or, maybe set aside until the right time or purpose? Maybe backed on cardboard (hung on the wall or made into a box..) to receive 3×5 note cards of passing Ideas, and Inspirational Quotes? Your stitches are so beautiful, wonderful colors, and the little buds in Springtime just seem to want to GROW! As an artist, I completely sympathize. You can try to do a drawing or painting on bad paper, cheap canvases or with bad materials, but there comes a point when you have to face the fact that your materials are working against you, not with you. Everything you do seems to make things worse. Waste no more time and decent materials on it. Sometimes the wisest thing to do is call it a loss and move on. What about artists linen found in art shops by the yard? This is what fine oil painters use, lighter than Artist canvas. How about a really nice linen twill from The Crewel Work Company (UK)? I know it sounds pricey for a tote but as you say at the beginning, “What’s your time worth?” It is such nice linen as you know from working on the Mellerstain Firescreen. My standards must be lower because I don’t see it. You’re stitching is always beautiful. But having said that you should stop. It will always bother you. It will seem like a chore and you’ll start getting sloppy just to get it done. Set it up as a give away for the ones who’ll stitch anything that does’nt move. I second the suggestion of cotton duck. I just (finally!) finished some grocery bags out of duck that I prewashed (I *always* prewash all my cloth) and cut out at least 15 years ago. The cloth is crisp, irons very easily, and has lots of body even without lining. And it comes in lots of colors. Otherwise, I also second the idea of doing a fusible or other interfacing to give the cloth body for sewing into totes, and use better fabric for embroidered pockets. I assume all totes will need washing, and my preference is to use the washing machine, but since I don’t have a decent delicates cycle, I would wash hand-embroidered totes by hand anyway. You could wash your bags inside a pillowcase! Just use a rubber band to hold the pillowcase closed and wash in cool/warm water like you would by hand. Unless it is very delicate fabric, I wash things like this often. Even precious loveys/stuffed animals my kids thought they needed to sleep could be both washed and dried inside the case. I did have one fail though. A stuffy “escaped” once when the rubber band broke. All the fur shrank back to fuzz. It had washed successfully prior to that, so I know the pillowcase really protected well. Good luck! Our local quilting and fabric store sells a cork fabric that can be used for the bottom and lower part of totes and bags. It looks quite lovely. I have not used it, but it seems interesting and is natural. It might add a decorative interest to the base of a tote. Sotema in Milan. Wonderful linen. There’s also some pretty good linen twill at Penelope on Etsy. Linen twill makes wonderful bags. Anna Lee from the SF School of Embroidery told me last week that “If I’m not enjoying what I’m embroidering…stop. Life is too short.” I’ve been struggling through this Assisi embroidery. She suggested I finish just the corner, cut it, put it in my notebook and move on. I chose too ambitious a project for a type of embroidery that I have not done before. Embroidery should be fun. I agree with the canvas suggestion. It comes in many weights, colors, and prices. I sympathize with you. I have a few unfinished projects that I tearfully surrendered continuing despite all the work I had already done because “it just doesn’t look right”. I kept them with the hope that something could be salvageable (book mark, toss pillow?). I have recently finished an Ethnic underskirt, a gift for my God daughter, on European homespun hemp cloth and found that a section where the threads were looser because a thread had probably been dropped in the loom. I was fortunate that it was in a section with Whitework so I could “camouflage” the dropped thread. Besides, this would be near the hem, so only I would know what really happened. This type of fabric is sturdy and could be used for a tote bag. It is usually only available through “artisanal” weavers, although sometimes you can find vintage long shirts made from homespun hemp cloth on EBAY or ETSY. It can be pricey if the embellishments are still in good cindition. But if you get lucky, you can find less expensive pieces that the remaining homespun is still quite usable. It is normally white or geisha but takes up dye well. And it is definitely sturdy. After you’ve finished the embroidery, use a fusible stabilizer (such as the Pellon fusibles for handbags) to strengthen the tote and give it some body. You can then add whatever bag lining you’d like. This is my go-to cheat for embroidered bags that need stability. Hi Mary, I’ve painted and embellished “painter’s canvas”–a better art store will carry it on a big roll for fine art painters to gesso/size/paint. It’s 100% cotton, usually comes in a couple of sizes of weft/warp, is quite sturdy and pretty clean in terms of slubs. You would have to bleach it as it is a natural ecru. Good luck. Your ideal tote sounds gorgeous! Do you know about Kraft Tex? It is a paper/fiber blend, non-woven material. It doesn’t come in yellow but is easy to paint, dye, stamp, color, made to look like leather, etc. It can also be machine washed. It sews easily by machine. For hand stitching it would need to be softened by washing or at least soaking. It’s widely available and not overly pricey. You can get lots more information online. 1. I only have “X” amount of life left and I refuse to spend the time on a crappy project or even one that my heart’s not into. Give it away or throw it away. 2. Have you tried Britex Fabric in San Francisco? I’m assuming they are still in business as I was told they were one of the few “premier” retail fabric shops in the nation. Ten years ago I bought a large amount of a fabric that I’m still using but I have no idea what it’s called. You might try fusing a heavy weight backing on a medium weight quality linen after embroidery and then using that as your tote bag fabric. Thank you Mary for the lesson in “knowing your fabric”. I bandy the word “slub” around but did not have any real understanding on what it meant. Thank you also for this fabulous blog site, we will never meet in the flesh, but be assured I regard you as my embroidery tutor in so many ways! I needed a therapy project last August and wanted a sturdy tote bag with a nautical theme. The local fabric shop had a blue remnant of sun release. It worked very nicely. I used 5/2 and 10/2 cotton. Stayed tight to stretch, and I have enjoyed it ever since. The fabric remnant was Sunbrella. I made up 3 totes (Mum, sister & me!) to hold our needlework projects. I used a 100% cotton duck (Artee Cotton Duck). It was affordable enough that I purchased a yard in four different colors. The totes were decorated with a combination of applique and embroidery. I lined them with a pretty multi-colored batik cotton (that incorporated all the colors of the duck cloth) so one lining fabric served any color bag very well. I didn’t have to use any additional interfacing, not that they are really stiff. I didn’t wash the fabric first and I have no idea how it would go through the wash. We haven’t tried to wash them yet and it’s been a few years. The fabric framed up well, I even used a bit of it to do a crewel pillow. While I have no idea about linen, I adore the pattern you’ve traced out. It’s so pretty, and the colors you’ve chosen so far are charming! I too am an optimist and am proud of the amount of time you put into believing! What about a “good linen”. Other than that I don’t know, but that fabric is not worthy of your work. A minor bump in the road and the fabric! Thanks for sharing..
Denim! I love stitching on denim! There are lots of colors now and the choice of weights are varied. Whatever you choose, you will make it look fabulous! I think you should be stitching on the fabric you like and attaching to a matching color premade tote. Nothing wrong with that and probably much sturdier. After the washing experience, I figured you put that linenin the rag pile. Guess it’s going there now. Actually, I’ll use it for toweling. Serge the edges, and it’ll be fine for kitchen toweling, for as long as it lasts! 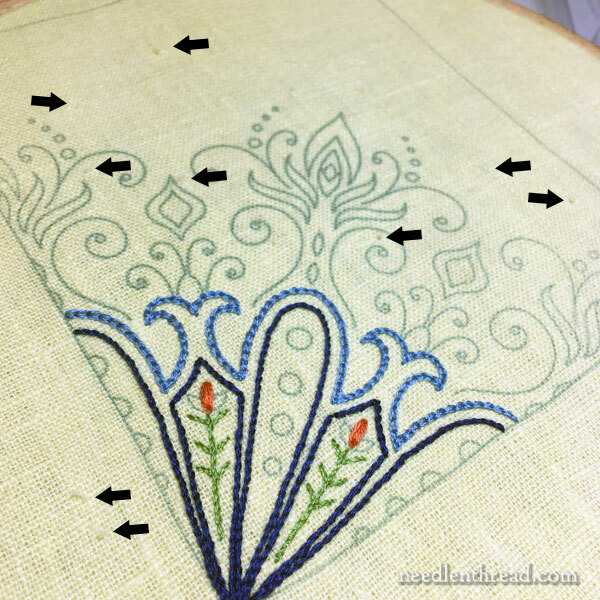 Mary, have you tried embroidering on cotton canvas for your bag project? Upholstery type canvas is sturdy and comes in some nice colours. I used it once on a small project and it “hooped” very well. It’s on my list for trying out! Thanks, Leah! I know the fabric is a disappointment to you but the pattern and the colors are really nice! I love the light blue & would like to use it. What’s the name and/or number? I buy my dying blanks from Dharma Trading company. Maybe there is something suitable there? I think it’s always best to prewash linen, especially if it’s rustic, such as what you’re describing. When washed in hottest water, and dried on hottest setting, a few times, the linen will shrink and lose most of the mechanical stretch which happens during processing. This also means that when you need to wash your finished item, it won’t shrink. It never fails that you rue the day when you fail to prepare your fabrics for the life they’ll be leading, in my opinion. Your printed cotton should at least be washed in warm water if you think it won’t do well in hot (such as metallic prints) and machine dried, starched and pressed before sewing. Hi, I am by no means an experienced embroiderer.! Why not use a lighter linen that you know will work and look good. Then line with a heavier/plain linen to give strength etc and finally line the inside with a prettier fabric. ? Does this make sense? I think you will have to go to a fabric store — if you can find one — and actually feel the fabric before you buy any. You may want to examine both home dec fabric and fashion fabric. Consider ironing a stabilizer onto the back of your fabric before you start stitching. That’s what most of the ladies in my stitching group do. I have not done this before, but I’ve mostly stitch on cross stitch fabric. I think it is something I will do before attempting my next stitching adventure. I think it will solve some of my uneven stitches problems. The stabilizer should help keep your fabric tight in the hoop and will keep it from stretching as you stitch. The pattern was beautiful, what was the stitch? Like you I have gone to stamping my own projects, the kits from on line catalogs are like cheesecloth and I feel I am wasting my time doing the stitching; however I have purchased some just to trace off the pattern and sell the kit at a fraction of the cost. Looking back at some of my first projects all were good quality cotton or linen and have been around since the 60’s. today when I purchase material to stamp, I pre wash by hand, line dry and press using “Best Press” gives just enough body to work well– but not stiff. Oh dear! I have no suggestions for alternatives, but second your sentiment that poor-quality materials are almost always not worth spending time on. I’ve learned that the hard way, too! You might want to consider artist’s canvas…Cotton and linen. Pricing can be found on any of the art supply websites. Also, twill weave cottons (for free embroidery) would be a good option for a tote bag. But, if price is no problem, linen twill is another option. Hola, Mary! Thanks for your note! You can use Google translate, here: https://translate.google.com/m/translate and put the website address in the translate box. It will give you a translation. I hope that helps! So sorry for your pain with that linen Mary! Have you considered buying a pre-made “sac” (tote bag), then adding an embroidered patch pocket? There are some online resources for cotton & coated cotton totes in Provencal colors, some actually made there! There are also sources for Provencal fabric if you’d prefer to make your own. Tote bags can get ratty looking with frequent use & this would allow your embroidery to be easily transferred to another foundation. Check out the Souleiado site to see what they are doing with embroidery added to their totes. So, I’m not sure this would work for you– I once bought a small piece of very fine, un bleached, heavy weight Belgian linen canvas made for painting portraits (extra smooth) from a fantastic art supply store in NYC. It had some sort of sizing on it but softened up after I washed it. It is not super easy to stitch on but it’s lovely with the right colors and makes excellent patches. Try a home decor store and look for upholstery weight fabrics. I bought something for a crewel design (GCC class thru EGA) that originally was done on a watermark kind of fabric. It is shiny on one side and matte on the other with a slub weave. It is sort of heavy, but very easy to sew on. I also washed it in hot water and it did great. Loved this post! Yes I do understand the reluctance to abandon a project….is it about throwing in the towel or what, that makes us persevere until it is obvious to all but the blind that all the effort is really just a waste of time? It is not a good feeling, to have to admit that it would be better to stop. I like to finish things! Hmmm…….In my stash I have a couple of, I believe, flour sacks that were used and then returned to the mill for refilling. Heavy, textured, and closely woven with a colored band at either end. They seem to be cotton to me but entirely different weave than feed, seed, salt or sugar bags. I take them out and pet them and then put them away. I was considering using them for chair cushion covers but I bet one might make a tote or two–they are woven in a tube–but are probably unsuited for delicate stitches. I bought some upholstery linen a few months back from eBay to stitch on. It was heavy, held the stitches well and kept its shape. It’d probably do well for a tote bag. No suggestions, but interested in the answers! Heavy cotton duck canvas, I think it’s called….heavy, even weave, very nice for stitching. The other thing I love to stitch on for weight is good heavy denim. Handy, easy to find (usually), fun to stitch, and over time develops a nice hand, better than the canvas will. While I hate to mention the competition (although to my mind there is so much difference it isn’t really competition), Trish Burr sells a cotton sateen that is a terrific even-weave and strong. Personally I wouldn’t use white for a tote because I am a dreadful grot but for someone as fastidious as you it will be fine. I am curious about embroidering on a twill weave like denim. Can you tell us more about that please? I went to sign up for the give away as you said it is still open….. Alas …. the commments are closed …. sad. I have thought about make and embroidering my own linen cross body bag but I too have yet to find a decent material. If you do find something that works, please let us know! I have had your experience with linen, and I became intimate with the “I can live with this” mantra. Buying fabric on line is always a pig in a poke, isn’t it? My favorite way to find interesting linen is to go to a thrift store. People get rid of the most amazing things– clothes, curtains, old table cloths, placemats . . . and old, in the case of linen, can be better, because the sizing that tames the fibers and makes the fabric look sleek and up-scale has been removed. Someone has washed and tumble dried it so that you know exactly what it will look like when you wash it again, and if it is too slubby or too stretchy, you can stand in front of the $10 pair of curtains and make a good evaluation of its potential. I would recommend a really good furnishing linen. This is heavier and some are closely woven. Finnish fabric is also very nice mostly cotton but expensive. Previous Previous post: Stella Two – You Little Beauty! Next Next post: Needlework News Snips & Goldwork Book Winner!